Map depicting the commuting time from City Hall, in New York, to New Jersey and Brooklyn. Map showing the present distances in time from the City Hall New York to points in New Jersey, New York, and Brooklyn. This is an 1890 F.H. 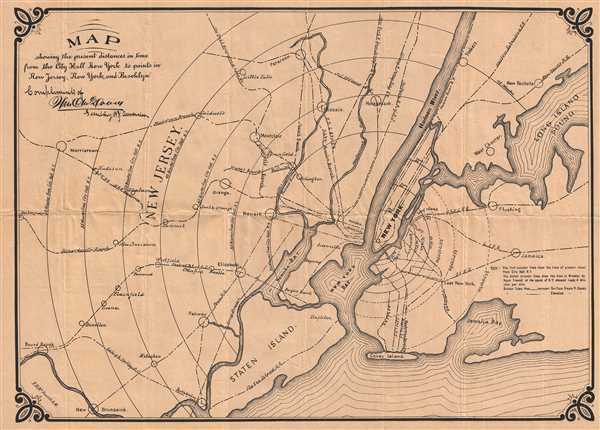 McDowell map of New York City and its vicinity. The map depicts from Bound Brook and Morristown, New Jersey to Long Island Sound, New Rochelle, and Jaimaca New York and from Paterson New to Staten Island. Manhattan Island slightly right of center, with concentric rings emanating from Lower Manhattan, meant to show the amount of time it takes to get to the locations noted on the map. Coney Island is noted, as well as Flushing. Other cities labeled in New Jersey include Hakensack, Passaic, and New Brunswick. Yonkers, New York is depicted along the Hudson. Several railroads are noted, including the Hudson River Railroad and the Long Island Railroad. The entire map is encased by an attractive border. This map was produced by F. H. McDowell, Engineer of Mines in 1890.